RIALL, Sir PHINEAS, army officer; b. 15 Dec. 1775 in Ireland, probably in Clonmel (Republic of Ireland), third son of Phineas Riall of Clonmel and Catherine Caldwell; m. 18 Dec. 1819 Elizabeth Scarlett in Borgue, Scotland; d. 10 Nov. 1850 in Paris. Phineas Riall entered the army as an ensign in the 92nd Foot on 31 Jan. 1794, gained a lieutenancy in March and a captaincy on 31 May, and became major in the 128th Foot on 8 December. After this rapid rise in seniority Riall served with the 128th until he was reduced with it in 1797. He remained on half pay for seven years, becoming a brevet lieutenant-colonel barely two weeks after his 24th birthday. On 21 April 1804 Riall transferred to a majority in the 15th Foot, and with it he saw his first active service and combat. He appears to have been with the 15th when it sailed for the West Indies in 1805, and he was certainly there by 1809, when he commanded a brigade in the attack on Martinique. Riall was also in charge of a brigade at the capture of Guadeloupe, and he was commended in dispatches. Following this flurry of activity, he returned to England in July 1810. On 25 July Riall was promoted brevet colonel by seniority, and he transferred to the 69th Foot as a lieutenant-colonel on 27 December. 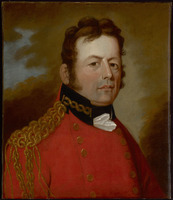 He was promoted major-general on 4 June 1813, again by seniority, and on 10 August he was posted to the Canadas along with Lieutenant-General Gordon Drummond*. 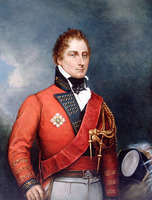 The Duke of York, commander-in-chief of the British army, referred to Riall as “an active and intelligent young man,” and there is no doubt that Drummond and he represented welcome reinforcements to Lieutenant-General Sir George Prevost*, commander-in-chief in British North America, who had had difficulties with some of his subordinates. Upon arrival at Quebec in November, Riall was sent to command in the Montreal region. Soon afterwards he accompanied Drummond to Upper Canada, where the latter took over as commander of the forces and administrator. Drummond was determined to attack the American forces on the Niagara frontier, and on 18 December he mounted an expedition against Fort Niagara (near Youngstown), N.Y. As soon as the assault force reached the American side of the Niagara River on the morning of the 19th, Riall crossed the river at Lewiston with 500 regulars and a similar number of Indians. Riall’s force had originally been intended to act as a reserve to the attackers of Fort Niagara, but because it fell so quickly he was able to act elsewhere. Encountering virtually no opposition, he entered Lewiston and captured a quantity of ammunition and supplies. As the Americans retreated, Riall moved through Youngstown and a Tuscarora Indian village, leaving behind charred ruins, as the Americans had at Niagara (Niagara-on-the-Lake) earlier in the month. All parts of Riall’s force committed depredations, but the Indians were particularly cruel and killed several civilians. It is unfortunate that the operation got out of hand, because in other respects it was highly successful. Riall advanced past Fort Schlosser and Manchester (Niagara Falls), both bf which were razed, as far as Tonawanda Creek, less than ten miles from Buffalo, before returning to Queenston via Lewiston Though a vast array of stores and many soldiers had been captured, Drummond was not satisfied. He wanted to ensure that any threat on the Niagara frontier was eliminated for a considerable time, and on 29 December he instructed Riall to cross the Niagara again, this time to disperse the increasing American forces and raze the villages of Buffalo and Black Rock (Buffalo) “in order to deprive the enemy of the cover which these places afford.” Provisions and flour were to be brought back, and any stores incapable of being moved were to be destroyed. Most important, Riall was to burn three American naval vessels on shore near Buffalo Creek. Drummond issued strict instructions against looting and intoxication in order to avoid the excesses of Lewiston. Except for some minor problems, the operation went off almost exactly as planned. During the night of 30 December, Riall landed above Niagara Falls with a force composed mainly of regulars but including some militia and Indians. After repulsing American attacks on their initial position, the British pushed on at dawn against a strong resistance. When they persisted in their attack the defenders broke and ran, leaving behind stores and ordnance. Buffalo was taken, the vessels were burned, and, as Riall reported, “considerable quantities of clothing, spirits and flour” were set on fire. Buffalo and Black Rock, both of which had been evacuated, were then also burned. Riall now dispatched a force which destroyed “the remaining cover of the enemy on this frontier” towards Fort Niagara. Within a period of about three weeks the situation on the Niagara frontier had completely changed. It is not clear, however, to what extent the credit for the British successes should be divided between Drummond, who took the responsibility for the offensive and made the plans, and Riall, who led two of the key operations. Riall did not have long to wait. On the morning of 3 July he learned that an American force had landed near Fort Erie, and he immediately rode to Chippawa, ordering reinforcements to follow. Fort Erie surrendered after a token resistance and the American force of about 4,000 men advanced towards Chippawa. Late in the afternoon of 4 July, the American brigadier-general Winfield Scott, commanding the advance guard, could see Riall’s troops across the Chippewa (Welland) River, and he pulled back a couple of miles for the night. The next day both armies wanted to attack. Riall had been reinforced and, because of his belief in the inferiority of American troops, he was prepared to pit his estimated 1,500 men against Scott’s 2,000. At about 5:00 p.m. he came out from behind his works to give battle. Riall quickly learned that the enemy had used the last few months well. Scott’s disciplined and well-trained force inflicted heavy casualties on his own in a classic European-style battle. Riall has been criticized for failing to coordinate the components of his force, but not for a lack of courage. He led from the front. As casualties mounted, however, and it became clear that the Americans could not be bested, he retreated across the Chippawa. He had lost over 400 in killed, wounded, and missing; the American total was lower by about 100. Two days later he had to retreat all the way to Fort George (Niagara-on-the-Lake) to avoid being encircled by the advancing Americans. The British admitted defeat, but none of their leaders was prepared to concede the campaign. Reinforcements flocked to Riall at Fort George, and Drummond himself headed for the Niagara peninsula. The Americans had followed Riall to the vicinity of Fort George, but after waiting in vain for their navy to cooperate in assaults on forts George and Niagara, they retired towards Chippawa. Riall had busied himself in preparing his forces for the battle which was inevitable, and when the Americans withdrew he pushed forward about 1,000 regulars, who assumed a strong defensive position at Lundy’s Lane near Niagara Falls. Drummond had ordered him to follow and harass the enemy but not to attack or act precipitately. Consequently, when Scott moved against the position at Lundy’s Lane on 25 July, Riall started to withdraw. Fortunately, Drummond arrived with reinforcements and countermanded Riall’s order. In the battle which ensued Riall was severely wounded in the arm and captured early on, and he could hardly take much credit for the victory. Riall spent the rest of the summer and most of the fall in congenial captivity in the United States. A fellow prisoner, the young militia officer William Hamilton Merritt*, described him as “very brave, near sighted, rather short, but stout.” Efforts were made to exchange Riall, but without any success until November. Before he sailed for England on parole in December 1814 he visited other prisoners, giving the impression of a caring commander. No mention can be found of Riall for over a year after his return to England, presumably because he was waiting for his wound to heal. He surfaces on 18 Feb. 1816 when he was appointed governor of Grenada, a post he held until 1823. On 27 May 1835 Riall was promoted lieutenant-general, and in 1831 he was made a knight commander of the Royal Hanoverian Order. Two years after this honour he was knighted. On 20 May 1835 Sir Phineas was appointed colonel of the 74th Foot, and on 24 April 1846 he was transferred to his old regiment, the 15th Foot. He had been promoted general on 23 Nov. 1841. Phineas Riall appears to have been an example of a young man from a family of means who owed his early advances in the army to the purchase of commissions. When called upon to command troops in battle he acquitted himself with some distinction and earned further promotion, as well as awards and commendations, by merit. 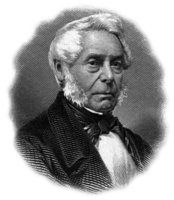 During his short stay in North America he played a significant part in the war on the Niagara frontier. PAC, RG 8, I (C ser. ), 230: 17; 388: 146–51; 389: 174; 681: 38, 240, 249–51, 267, 319; 682: 2, 5; 683: 19–20, 96, 171–74, 183–85, 192, 230, 306; 684: 14–17, 51, 57, 65, 84, 116, 124, 126, 129, 134, 169, 177, 179, 198, 202, 237; 685: 271; 686: 8; 688E: 150; 692: 172; 693: 146, 193; 694: 6, 49–50; 1171:105; 1172:70a; 1203 1/2K: 88; 1203 1/2L: 78; 1219: 134, 176, 180–82, 230, 245, 260, 266; 1221: 106, 211, 235–36; 1222: 4, 13, 132, 165; 1227: 7, 46, 91. Doc. hist. of campaign upon Niagara frontier (Cruikshank). Gentleman’s Magazine, January–June 1851: 202. Select British docs. of War of 1812 (Wood). Quebec Gazette, 4 Nov. 1813. DNB. G.B., WO, Army list, 1800–36. Hart’s army list, 1841–42, 1847. Officers of British forces in Canada (Irving). Gilbert Auchinleck, A history of the war between Great Britain and the United States of America, during the years 1812, 1813, and 1814 (Toronto, 1855; repr. London and Toronto, 1972). J. W. Fortescue, A history of the British army (13v. in 14, London, 1899–1930), 7: 12–17; 9: 346–49; 10: 106. D. E. Graves, “Joseph Willcocks and the Canadian Volunteers: an account of political disaffection in Upper Canada during the War of 1812” (ma thesis, Carleton Univ., Ottawa, 1982). J. M. Hitsman, The incredible War of 1812: a military history (Toronto, 1965). G. F. G. Stanley, The War of 1812: land operations ([Toronto], 1983). Carl Christie, “RIALL, Sir PHINEAS,” in Dictionary of Canadian Biography, vol. 7, University of Toronto/Université Laval, 2003–, accessed April 26, 2019, http://www.biographi.ca/en/bio/riall_phineas_7E.html.